Bexhill Cricket Club safely negotiated its opening match in the Gray-Nicolls Sussex T20 Cup on Saturday. Sussex Premier League side Bexhill triumphed by eight wickets at home to Division Four team Hellingly thanks largely to splendid performances from Joe Cox and Shawn Johnson. Bexhill restricted their opponents to 103-9 after winning the toss and electing to field, although it looked like being a good deal less than that when Hellingly were 17-4 and 38-6. Opening bowlers Johnson and Dean Crawford - both of whom returned terrific figures of 1-5 off four overs with two maidens - removed Hellingly’s opening batsmen Adam Pye and Daniel Pellett with the score 12. Cox then took centre stage, claiming all of the next four wickets to fall en route to figures of 5-35 off his four overs. He firstly dismissed Michael Williams and Arthur Rossi in successive deliveries with the score 17 before dislodging Gavin Sutherland and Greg Devlin (15) within six runs of each other. Hellingly’s lower middle order rallied well, however. 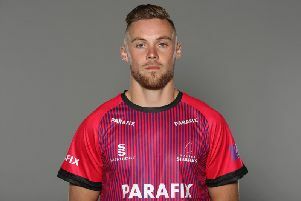 Andrew Rose smashed 25 off 14 balls until being bowled by Liam Bryant and Cox completed his five-for by trapping Hellingly captain James Pooley lbw for a fourth ball duck to make it 70-8. Will Edwards (1-3 off two overs), who was playing for Bexhill’s under-16 team last summer, marked his competitive first team debut by getting rid of Adam Devlin to leave Hellingly 88-9, although David Rippengal’s 18 not out took the visitors into three figures. Johnson spearheaded an ultimately comfortable run chase with a highly impressive 75 not out featuring 11 fours and two sixes, one of which was a big hit over long-on to seal victory midway through the 16th over. Fellow opener Tim Hambridge fell for four to impressive young spinner Christopher Morris (1-12 off four) with the score 26 and Malcolm Johnson was the other batsman to be dismissed, departing for 12 with the score 69. James Walker was four not out on his home debut.